The Mi'kmaq of Newfoundland and Labrador inhabit the island portion of the province. They historically harvested resources in the Gulf of St. Lawrence and most surrounding lands, which placed them into direct and frequent contact with early European fishers and settlers. Although not all contact between the Mi'kmaq and Europeans was negative, it dramatically altered Mi'kmaq society and cultural traditions. Watercolour by Mary R. McKie. Courtesy of Library and Archives Canada (C-151329). By the end of the 18th century, Mi'kmaq people throughout the Atlantic region were trading furs with Europeans for metal tools, wool blankets, and other manufactured goods that often replaced Mi'kmaq handicrafts and other material items. Logging operations and the construction of the railway during the 19th and 20th centuries destroyed valuable caribou habitat and attracted new settlers into interior lands used by the Mi'kmaq, which helped erode Mi'kmaq culture and language. This was compounded by the establishment of churches and schools during early 1900s, both of which had considerable influence over Mi'kmaq lifestyles and traditions. At the same time, many Mi'kmaq adapted to their changing circumstances by obtaining employment as guides for explorers and visiting hunters, or as woodsmen in the forestry industry. However, the failure of provincial and federal officials to provide for the Mi'kmaq people within the terms of Confederation in 1949 severely undermined the group's ability to protect its culture; unlike most Aboriginal groups in Canada, Mi'kmaq and other Aboriginal people in the new province could not initially access programs and funding from the federal Department of Indian Affairs. To safeguard their resources, land, language, and culture from outside influences, the Mi'kmaq people helped form the Native Association of Newfoundland and Labrador in 1973, which later changed its name to the Federation of Newfoundland Indians. The Mi'kmaq at Mawpukek (Conne River), on Newfoundland's south coast, elected a chief and band council in 1972, and after years of negotiations, became registered as a band under the federal Indian Act in 1984; it formed the Samiajij Miawpukek Indian Reserve in 1987. In 2008, about 7,800 Mi'kmaq not living at the new reserve accepted an agreement-in-principle with the federal government to form a 'landless band' under the Indian Act. At the time of contact with European explorers and settlers in the early 16th century, the Mi'kmaq were a migratory people who exploited various resources throughout the Gulf of St. Lawrence. They largely fished in coastal areas during the spring and summer before moving inland to hunt in the fall and winter. Their homeland included mainland Nova Scotia, Cape Breton Island, the Magdalen Islands, Prince Edward Island, St. Pierre and Miquelon, as well as parts of New Brunswick, Quebec, and Maine. Mi'kmaq oral tradition states precontact Mi'kmaq territory also included parts of southern Newfoundland, but some researchers argue the group did not permanently occupy the island until the 1760s (Bartels and Janzen 1990). Charles Martijn, however, suggests the Mi'kmaq homeland included parts of southern Newfoundland at the time of contact and argues the group “once had a unified vision of this traditional homeland, whose eastern section constituted a domain of islands linked, not separated, by stretches of water, like the Cabot Strait, which served as connecting highways for canoe travel” (Martijn 2003). 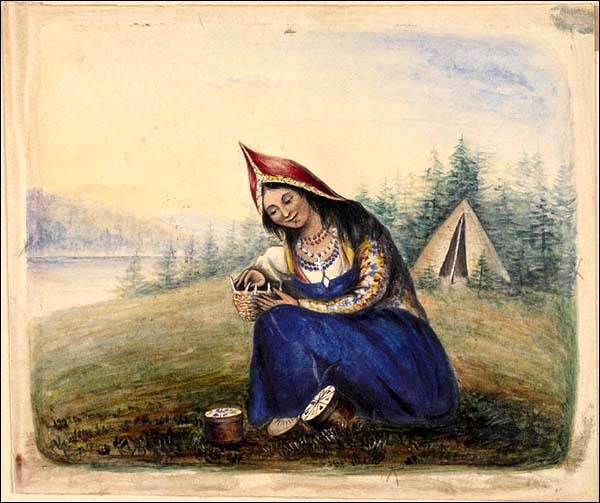 At the time of contact with European explorers and settlers in the early 16th century, the Mi'kmaq were a migratory people who exploited various resources throughout the Gulf of St. Lawrence. Detail of a photo by Paul-Emile Miot. Courtesy of Library and Archives Canada (PA-194632). Regardless of when the Mi'kmaq people established themselves at Newfoundland, European activities along the Gulf of St. Lawrence during the 1700s greatly influenced Mi'kmaq settlement patterns on the island. An increase in the number of European peoples settling at Cape Breton Island and mainland Nova Scotia resulted in increased competition for resources, which forced some Mi'kmaq out of their lands. In addition, the official surrender of New France to England in 1763 dramatically affected the Mi'kmaq, who allied themselves with the French. As a result of the surrender, the British government granted the Magdalen Islands to one of its colonels, Richard Gridley, who started a large walrus fishery there. This encroached on Mi'kmaq hunting territory which, alongside deteriorating relations with the British, prompted many families to leave in search of better lands. Many travelled to southern Newfoundland, where there were enough game and fish to accommodate traditional subsistence activities. At the same time, European settlement was minimal on this part of the island, giving the Mi'kmaq much space and freedom, while Roman Catholic priests at the nearby islands of Saint-Pierre and Miquelon were still available to accommodate the religious needs of the Mi'kmaq people, who had converted to Christianity after contact with Europeans. By the 1760s, large numbers of Mi'kmaq were living at St. George's Bay, Bay d'Espoir, Codroy Valley, Bonne Bay, and other areas of southern, western, and central Newfoundland. Photo by Paul-Emile Miot. Courtesy of Library and Archives Canada (PA-202288). Mi'kmaq oral tradition suggests that their people visited Newfoundland seasonally to hunt in the fall and winter months before returning to Cape Breton Island. Families began to permanently settle on the island by the 1760s, with high concentrations occurring at Bay d'Espoir, St. George's Bay, Codroy Valley, Bonne Bay, and other areas of southern, western, and central Newfoundland. Although they stayed on the island year-round, Newfoundland Mi'kmaq still practiced their traditional subsistence activities of fishing on the coast during the warmer months before moving further inland to hunt and trap. Mi'kmaq trappers also traded furs with French or English settlers in return for guns, clothing, copper kettles, and other manufactured goods. It became more common for Newfoundland people of European descent to settle at Bay d'Espoir during the 19th and early 20th centuries, which increased the level of contact between the two peoples. By 1875, there were more non-Aboriginal people living in the bay than there were Mi'kmaq. Most of the new arrivals supported themselves by logging, farming, fishing, hunting, and trapping. As a result of increased competition for traplines and hunting grounds, some Mi'kmaq moved to Conne River from other communities in the Bay d'Espoir. 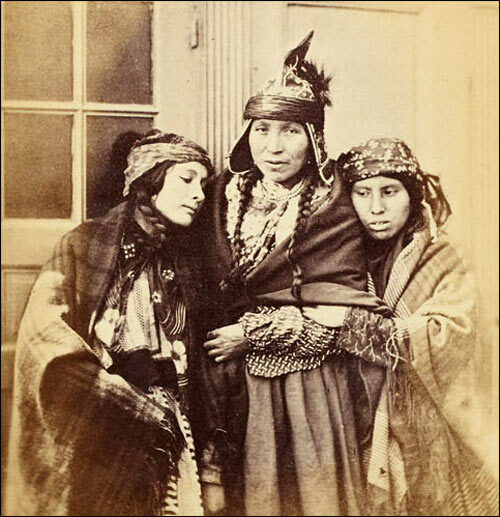 Intermarriages also became common, especially between Mi'kmaq men and European women. This helped erode the migratory lifestyle of many Mi'kmaq families, as wives often chose to remain at the villages year round with any young children, while husbands hunted or trapped elsewhere. 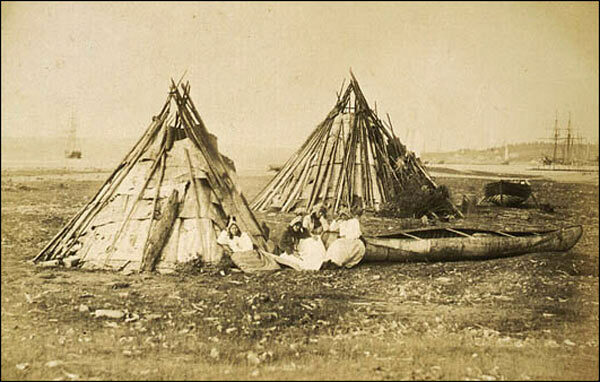 At the same time, many Mi'kmaq families began to abandon their traditional wigwams in favour of wooden-frame houses. The establishment of schools in the early years of the 20th century helped marginalize the Mi'kmaq language. Despite large numbers of Mi'kmaq living at Conne River, the Catholic Church established a school at that settlement in 1908 which provided instruction in English only. By this time, the Mi'kmaq people had been practicing Roman Catholics for more than 200 years; many were afraid to oppose Church priests, who had tremendous social and cultural influence over their parishioners. Stanley St. Croix was parish priest at Conne River for much of the interwar period and responsible for school administration. He ordered teachers to strap children who spoke Mi'kmaq in class and strictly forbade anyone from speaking Mi'kmaq at church. He also abolished the office of chief at Conne River, undermining the Mi'kmaq people's social and political structures. Such measures alienated many Mi'kmaq from their language and helped make them feel ashamed of their culture and heritage. Alongside his religious authority, St. Croix had considerable economic control over the Conne River Mi'kmaq because he established a mill at St. Alban's that provided work for much of the surrounding population and a dry goods store that accepted coupons from the sawmill. Other non-Aboriginal activities further altered the Mi'kmaq traditional way of life in the 19th and early 20th centuries. Construction of the railway in the 1890s attracted many caribou hunters into the interior, which resulted in the near-extinction of the species and loss of a valuable resource for Mi'kmaq hunters. Trapping also became a thing of the past for many Mi'kmaq in the 1930s after the Great Depression caused fur prices to drop significantly. Although hunting, fishing, and berry picking remained important activities, many Mi'kmaq families became increasingly reliant on the emerging logging industry for cash wages, supplemented with seasonal jobs as guides for visiting sportsmen and other tourists. 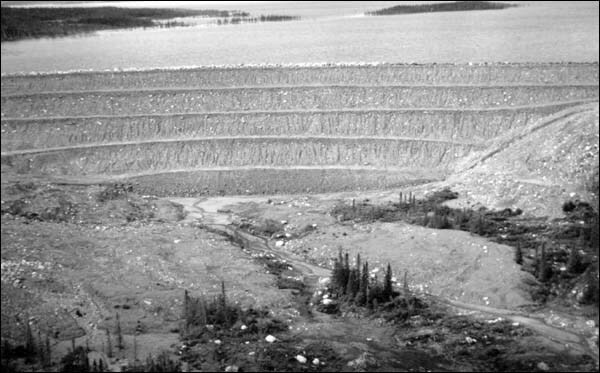 Bay d'Espoir North Dam, n.d. The Bay d'Espoir hydroelectric project flooded Mi'kmaq hunting grounds and destroyed caribou habitat. Reproduced by permission of Archives and Special Collections (Coll. 075, 5.05.127), Queen Elizabeth II Library, Memorial University, St. John's, NL. Large-scale industrial projects further affected Mi'kmaq society after Confederation. The Bay d'Espoir hydroelectric project flooded large tracts of caribou habitat and hunting grounds on the west coast, making it even more difficult for Mi'kmaq to harvest this traditional food source. At the same time, new transmission lines cut through numerous Mi'kmaq trapping lines, travel paths, and hunting grounds. At the time of Confederation, the Newfoundland and Labrador government did not have any special agencies to deal with Aboriginal affairs, nor had it developed a system of reserves or land claim treaties with its Aboriginal peoples. The Mi'kmaq also lacked any political organization that could voice their needs and concerns on the public stage, making their land, resources, and culture vulnerable to outside forces. To better protect their rights and heritage, the Mi'kmaq people helped form the Native Association of Newfoundland and Labrador (NANL) in 1973. The organization changed its name to the Federation of Newfoundland Indians (FNI) in 1976 after many of its Inuit and Innu members broke away from the group to form the Labrador Inuit Association and Naskapi Montagnais Innu Association (today the Innu Nation), respectively. After years of negotiations with the federal government, the Mi'kmaq at Conne River left FNI in 1984 to become registered under the Indian Act and form the Miawpukek First Nation. The federal government also recognized Conne River as a status Indian Reserve in 1987, with an on-reserve population of approximately 800 and an off-reserve population of approximately 1,700. Since then, the Miawpukek First Nation has experienced much economic and social success and is today one of the fastest growing communities in the province with one of the lowest unemployment rates. In 2008, the roughly 7,800 Mi'kmaq still in FNI and not part of the Conne River reserve accepted an agreement-in-principle with the federal government to form a landless band under the Indian Act. The federal recognition means Mi'kmaq people are better equipped to preserve their language, culture, land, and resources from outside threats.